The CRPHS5 is a compact infrared handset used for the basic programming of IR enabled Metway products. 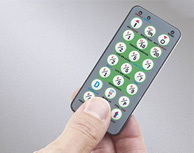 You must point the handset directly at the device that you want to control or program . When programming a device it is only necessary to point the handset when ‘sending’ a new setting. To send the programming parameters to the device follow the table on page 2 of the attached datasheet. The shift key is used to access the parameters in red and blue text. The Send LED flashes once to signify that a setting has been sent. For advanced settings use the CRPHS handset.